Ellis Parker Butler, Reina Marquis (holding a copy of “Danny’s Own Story”) and Don Marquis. Don wrote “Danny” while on the staff of the Brooklyn Daily Eagle, but he moved to The Evening Sun just before its publication on January 17, 1912. 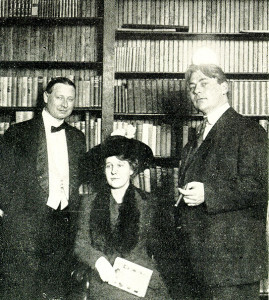 To celebrate the new book, Doubleday hosted a reception a few weeks later at its headquarters in Garden City, Long Island, and among the guests was Ellis Parker Butler, a well-known humor writer at the time whose best-known work, the short story “Pigs Is Pigs,” had been published six years earlier. At one point during the festivities a Doubleday photographer asked Don and his wife, Reina, to pose with Butler. No one at the time paid attention to an alarm clock sitting on a bookshelf directly above Don’s head, but when the photograph was developed the clock was gone — its glass face wiped out by glare from the camera’s flash. In its place, it looked for all the world as if an angel had come down from heaven and anointed Marquis with a halo. Here’s a bittersweet photo from the pages of the Brooklyn Daily Eagle, published January 11, 1920, showing proud papa Don Marquis and his two young children. Daughter Barbara, on Don’s knee, is just 16 months old, and Bobby, standing, is 4 years old. The photo appeared on a feature page of the Eagle that Sunday under the headline “Brooklyn Kiddies Smile at the Camera-Man.” Among other celebrities smiling for the camera that day was former President Theodore Roosevelt, holding his Brooklyn granddaughter Edith Derby. The bittersweet aspect to this photo comes from events looming in the future. 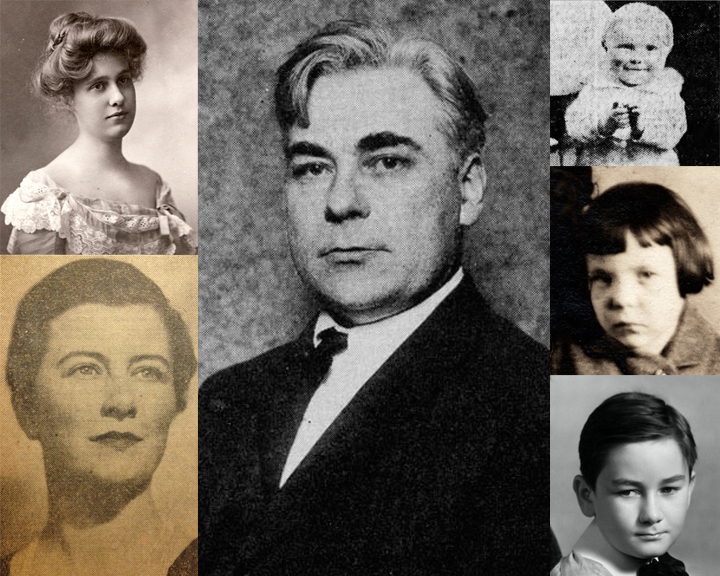 Bobby, always a sickly child, would die barely a year later, on February 15, 1921. Barbara also suffered from a frail constitution and died of pneumonia on October 24, 1931, at the age of 13. Absent from this photo is Don’s wife and the children’s mother, Reina Marquis. Her story only adds to the impending gloom. On the evening of Dec. 2, 1923, just a few weeks after she and Don and Barbara returned from a three-month trip to Paris and London, Reina became violently ill and died within an hour from myocarditis, an inflammation of heart muscle. Don, who would live to also see his second wife die, somehow endured these tragedies while wearing the mantle of a funny man. One can only imagine the heartache that lived inside. July 29, 2011, is the 133rd anniversary of Don’s birth. He entered the world in Walnut, Illinois, the eighth and youngest child of Dr. James S. and Elizabeth (Whitmore) Marquis. Growing up in “a little town with muddy streets” on the Illinois prairie, 100 miles west of Chicago, Don spent his childhood fishing when he could, tending the family garden when he had to, and reading every book he could get his hands on. He worked brief stints as a chicken plucker, canal digger, sewing machine salesman, schoolteacher and weekly newspaper editor (and printer) before moving to Washington, D.C., in 1900 to take a job with the Census Bureau. He drifted into big-city newspaper work as a part-time reporter for the Washington Times. After an exceptionally brief editing job at the Philadelphia North American — it’s unclear whether he was fired or just supremely unhappy — Don moved to Atlanta in 1902 to take a job at the Atlanta News and then the Atlanta Journal as editorial writer. Don was a popular newspaperman in Atlanta, and his carousings with sportswriter Grantland Rice and columnist Frank L. Stanton were literally the stuff of legends (more on that another day). In 1907 he was recruited by Joel Chandler Harris to join a new publishing venture, Uncle Remus’s Magazine, as associate editor, and his star never stopped rising. But there’s another reason why Don always talked fondly of Atlanta: That’s where he met and married Reina Melcher, a freelance writer at Uncle Remus’s. She was the great love of his life. Don and Reina moved to New York City in 1909 without a job but with plenty of enthusiasm, and in 1912 — after more than a year at the Brooklyn Eagle and his first book, “Danny’s Own Story,” getting strong reviews — he joined The Evening Sun, where his daily column, The Sun dial, debuted a year later to instant acclaim. Archy the cockroach made his first appearance in print on March 29, 1916, and the rest, as they say, is history. Happy birthday Don!